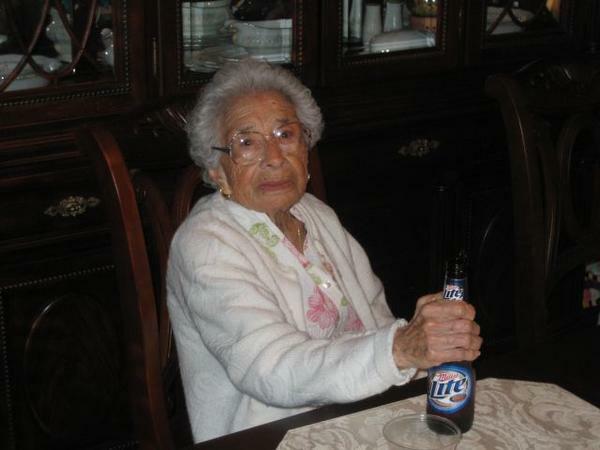 Today my grandma celebrates her 94th year of life. She has seen more in her lifetime than I could ever imagine. Even at 94, she is keeps going and going just like the energizer rabbit, and is always more than willing to take a trip to Wal-Mart to spend 4 hours shopping only to leave with three items. Since I could not be in Houston to partake in the birthday festivities, I have to raise my Miller Lite from sunny Florida and wish her a happy birthday. This entry was posted on June 13, 2008 at 9:31 pm and filed under Fun Times,Random Thoughts. You can follow any responses to this entry through the RSS feed. You can leave a response, or trackback from your own site.